Die Publikation, eine um einige Autoren und Themen erweiterte Auflage des Buches Failure Management (2016), erscheint in englischer Sprache und bietet einen umfassenden Überblick zu einem bisher weitgehend unerforschten und faszinierenden Thema: dem Scheitern in der Geschäftswelt. Rückschläge, Fallstricke, Flops und Enttäuschungen in Unternehmen, in Management oder Beratung – Experten aus verschiedenen Bereichen beleuchten das Thema aus unterschiedlichen Perspektiven und kombinieren es mit empirischen Erkenntnissen und relevanten Fallstudien. The present contribution deals with failure in organizational change processes. After a brief illustration of various drivers for change, failure at the structural and at the process level are discussed. Two case studies are presented to enrich the discussion. 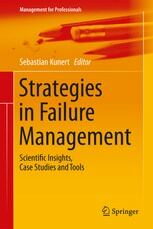 Lessons that can be learned from the failures described in the practical cases are explored. The chapter closes with a discussion of implications in dealing with failure in organizational change. Failure in Innovation: Is there such a Thing? In the context of innovation failure is an interesting concept, one that has different connotations and different implications to most other contexts. Whereas in most contexts failure is something bad, to be avoided at all cost, in the context of innovation failure is considered to be not only a necessary evil but often a precondition for success. Innovators are encouraged to embrace failure and consider it to be a learning experience. This does not mean that high failure rates in innovation should be accepted nor that success rate cannot be improved. Particularly in the challenging context of the 21st century where innovating is a key necessity for survival we need to unearth the deeper roots of failure, one of which is fear. Even if it is often argued that there is no such thing as failure innovation, just learning, there still is failure in the context of innovation. This chapter will investigate failures in innovation (rather the of innovation) and propose some tools and approaches to remedy them. The rate of failure in projects is much higher than would be expected. In fact, there seems to be a close connection. As statistics reveal, only a small percentage of projects can be claimed to be successful. Most cited failure factors are unclear objectives, insufficient communication, lack of top management support, and poor scheduling. As we show, these factors disregard the context, genesis, and transfer of projects. Failure starts already with collecting and selecting good ideas. After that, the planning is much more crucial than most people would expect. Finally, projects can fail at the end when an organisation is confronted with the generated outcomes. The most general cause of failure, however, lies in the reason for existence of projects. We assume projects exist to fail. The article is illustrated with a case study and ends with some recommendations on how to deal with failure. In this paper, we will discuss different processes teams undergo in situations which are difficult to work out because of their dynamic and complexity. There are a variety of requirements to be met to successfully deal with such situations: definition and analysis of the problem, appropriate handling and integration of partially non-available or even contradictory information, generation of solutions but also the prioritization and selection of one or more ‘correct’ solutions. Furthermore, the disciplinary knowledge of the team members play an important role, especially when it comes to heterogenous teams with mixed disciplinary background. Experts often overestimate the importance of their own discipline and thus communicate domain-specific knowledge either simplified or in an overcomplicated way. Both approaches do not reach the aim to arrive at a shared understanding within the team. From the research point of view these situations are of special interest, because it would be very valuable to find out which factors can turn the communication into a successful one and what we can learn to support heterogeneous teams to better reach a mutual understanding in the team on the one hand and derive knowledge of how to teach students to better reach a shared understanding before important decisions are made. However, there are also teams working together and performing well or even better. What are the preconditions? What can we learn from them? Research results indicate that teams can only work together successfully when they invest enough time to go through the necessary stages of team development. Of course, the crucial factor is not the amount of time but the mental models of the team members which need to be at least partially known to each other group member and aligned most efficiently in the first stages of teamwork. Examples show, however, that there is also risk in teams, which know how to communicate in a problem-oriented way but lack team-orientation. The mystery of what leaders can and ought to do in order to spark the best performance from their people is age-old. In recent years, that mystery has spawned an entire cottage industry: literally thousands of “leadership experts” have made careers of testing and coaching, all in pursuit of creating businesspeople who can turn bold objectives into reality. Still, effective leadership eludes many people and organizations. Strong leaders and strong leadership teams are essential to sustaining today’s high complex and globalized business. On the other side, ineffective leaders represent the way to organizational disasters. What are the elements that could help us to recognise the incipient of a leadership failure? Let’s discover it together. In this chapter cognitive traps are addressed that may raise the likelihood of failure in innovation decision making processes. At the beginning of the chapter we will discuss why managerial decision making processes in innovation projects are marked by challenging attributes such as novelty, uncertainty, complexity, a high level of conflict intensity and volatility. Managers can deal with those challenges only within the limits of their “bounded human rationality”. Based on a cognitive psychological perspective, typical biases in judgment and decision making in innovation contexts are presented. It is argued that bad decision outcomes and experiencing failure in innovation decision making is not to be avoided com-pletely: biases are a part of human decision making. However, one effective strategy to address biases in decision making is presented: Embracing and accepting one`s own cognitive limits can actually reduce the vulnerability to typical biases in managerial decision making. A lack of training transfer at the workplace might be regarded as failure in personnel development. Only if newly gained skills during training and development are applied to the workplace and lead to changes in behaviour, personnel development is worth the effort. In the following chapter first, a short introduction to training transfer research is given. Second, literature about the so-called ‘transfer–problem’ is summarized. As past research has shown, it is not evident that newly gained skills are applied to the workplace. Different factors that were found to influence the failure or success of training transfer are described. In the next parts of this chapter ways to analyse and to improve the learning transfer system are characterized. The chapter ends with a case of a leadership training and describes reasons for failure in training transfer that are often overlooked in practice. The purpose of this paper is to provide an overview of the reasons for the failure of a company foundation. For this purpose, the current studies in this area are discussed. These studies clearly show that the number of startup companies has declined in recent years. In addition, the number of startup companies is lower than the number of company closures. This raises the question of how the failure of company foundations can be avoided. In the following, the individual studies are presented, in which possible causes for the failure of founding teams could be identified. The authors particularly examine studies on startup companies from which a typology of the failure of startups is derived. For the individual cells of this typology, examples are shown in detail below. Furthermore, it is investigated whether cultural differences of failure influence company foundations. The article finishes with conclusions for the practice, which should help future start-up companies not to commit the same mistakes. Failure is a growing problem for large non-profit organizations (NPOs). If they find themselves in trouble – regardless of whether it is an executive accused of corruption or controversy over this year’s salary increases – a media scandal inevitably looms. Why? The media’s best-selling product is the scandal. And NPOs are predestined to deliver that product. While the term “non-profit” implies just that, and while it may truly be the case, a suspicion often lingers that something is not quite right. Charitable organizations are built on trust, yet a favourite media narrative in Germany and elsewhere is to ask: Do they practice what they preach? Of course not. Every organization is destined to experience failure of one sort or another. This makes non-profits the perfect target for muckraking, given their role as the “good guys” and the knowledge that no one is unfailingly good. Although this has always been true, the media environment has changed completely in recent years. The digital revolution has caused an explosion in the demand for morality tales. Every local newspaper, every investigative blogger is looking for one. NPOs have to deal with that demand. Yet there is a long tradition, especially in Germany, of allowing them to work quietly behind the scenes. As a result, non-profits have developed a quasi-governmental bureaucracy and a strong dislike and distrust of the media. Dealing with today’s media means learning how to communicate failure, and media crises are an extreme example of failure in organizations. In the context of this book, they offer an additional, potentially enlightening perspective on the topic. By providing examples of German organizations, this chapter describes an abbreviated skill set non-profits can use for their public relations in times of trouble. The approach in brief: bring back ambivalence, where mono-causality or oversimplification and self-righteousness now rule. Jonas Schumacher founded the Germany-based non-profit organisation Masifunde Bildungsförderung e.V. that coordinates a nationwide network of expatriate volunteers. He lives in South Africa, where Masifunde Learner Development NPC works with more than 100 employees at three sites reaching daily over 1.000 children and youth with holistic education programmes. We talk about clash of cultures arising from different expectations, behavioural standards, deep-rooted stereotypes, unfeasible constellations, and how to cope with all that. Failure in Consulting - Consultation Cannot Fail! Whenever I speak of “consulting” in the following article, that term is meant to cover all consultation formats concerned with processes, i.e. any form of consulting that is not an expert consultation. Process consulting makes use of reflecting on social systems, individuals, small or large groups, as well as organizations. Clients reflect on themselves, analyse the situation and/or various possible solutions for problem situations, and finally arrive at conclusions and decisions. If that constitutes the core of consulting processes, then consultation cannot fail, unless no consultation has taken place. Consultation means working with and working at relationships. Relationships are subject to change. In the course of a consultation process, the relation between clients and consultants undergoes a transformation. Nevertheless, a balance between distance and closeness needs to be kept if the consultation is to be a professional one. Consultation is thus fluid rather than fixed, but still solid, and stable in its flexibility. Relationships can fail. They may fail to come about, they may be interrupted, they may be ended. The end of a relationship is not equal to the consultation having failed, because the end has been thought about, reflected and decided on. Consulting means working with and within contradictions. Distance and closeness, methodological handles and method-free actions, dependency and freedom, knowledge and curiosity, potency and withdrawal. The following text describes and discusses these contradictions. Coaching has gained in popularity in professional contexts and organizations as a modern and people-focused counselling resp. consulting format. The more it is applied by practitioners, conceptualized by theoreticians, and investigated by scientists, the more it is difficult to define coaching. Therefore, in this chapter coaching will be viewed as the art of creating a relationship based on the professional application of methods and tools, comparable to the work of a self-reflected craftsman. The chapter will reveal how important and essential it is to create and develop a sustainable coaching relationship between the coach and client for the coaching process to succeed. Failure in coaching is seen as failure in a specific relationship that is characterized by the organizational and the private context of the client and the often contradictory goals of the different stakeholders of these contexts. Furthermore, the uniqueness of the coaching relationship, and the multiple perspectives on success and failure within the organizational context will be investigated. Dealing with failure presupposes knowing what went wrong and who did a mistake. In the specific field of networks, both questions are not easy to answer because we still lack a mutual understanding of net-works and network management. Thus, before we can develop specific strategies against failure, we must specify the unique features of networks and their management. We will argue that networks are characterized by negotiation, trust and flexibility. The term ‘management’ suggests that networks can be governed just like formal organizations. However, these three criteria implicate the need to rethink the role of management in networks radically. We will use examples from the existing literature and from our own work with network managers to demonstrate how and why neglecting the unique logic of networks can lead to failure. Moving on from these insights, we will put forward recommendations for good network management to bring forth its professionalization – so that in future fewer networks fail and more move on successfully. This chapter takes an individual-based approach to failure in the nonprofit sector. Many NGOs are currently experiencing an overall decline in voluntary participation and a high fluctuation rate, which takes an enormous toll on their limited resources. This problem can be traced back to the experience of failure in individuals, whose needs, motives and desires have not been met. Based on theories of human motivation (self-determination theory) and research on volunteerism, we will organize the evidence in three different areas: individual experiences of failure regarding (a) the task, (b) social relations, and (c) structural characteristics. We suggest that, much like the HR in for-profit companies, NGOs need a strategic plan when it comes to their human capital. Drawing from case studies and empirical evidence, the chapter concludes with a series of best practice recommendations. In this chapter forms of failure in the military are introduced and discussed. Failure in the military is intertwined with organizational culture and therefore with cultural standards of the specific society. Nonetheless the definition of failure and success follows the specific logic of the military and its different states of action: cold for training and hot for deployment. How do organizational culture and military success (or failure) work in these different states? Burnout phenomena are often regarded as signs of inadequate stress tolerance and thus a reflection of personal weakness and failure by both the world in general and the affected persons themselves. Taking this view of burnout phenomena leads, in many cases, to a downward spiral of humiliation, deepening self-doubt and further impairment. In contrast, hypnosystemic strategies interpret burnout phenomena as an expression of a conflict in values at both the individual and societal levels and a resultant intensive identity crisis. This interpretation views burnout phenomena as an intuitive competence for developing health-conducive personal boundaries. The accompanying symptoms can be seen as a reflection of inner conflicts between, on the one hand, loyalty and total commitment to the task given to and taken on by an individual and, on the other hand, a longing to receive praise, recognition and a sense of belonging regardless of the levels of performance or success achieved. This conflict eventually leads to the phenomenon of burnout. The conflictual dynamic is also apparent and ultimately grounded in discrepancies at the organisational and societal levels. This chapter outlines and expands on this approach to burnout phenomena and describes how hypnosystemic strategies can contribute to a transformation of the conflictual inner dynamic into an optimal individual balance and how these strategies can be co-ordinated with health-conducive interactional processes in relevant relationship systems. A case study outlines an example of an idiographic modelling and monitoring approach to provide an understanding of the complex interactions of the system levels involved. Failure in design may occur anywhere in the process of design, but also when a finished design object interacts with the recipient. Failure is thus shown to be an integral part of the design activity and the design artefact. Remarkably, failure of existing products has often triggered the development of new radical innovations. Design might be one of several disciplines that has cultivated failure as part of its professional routine, and one that has developed a “sense of failure” because of it. In some phenomena that are presented in the main text, failure is identified as the reason for a perceived higher value of the final design artefact. The authors lay out the intersection of design and failure in a number of categories and connect them to findings from empirical research in a wide range of disciplines. Each intersection is packed with examples from history or practice to further shed light on it. The conclusion provides starting points to incorporate the reflections into the real-world practice of managers and other professionals who are interested in a new perspective in order to improve their own activities. If we want to use a technical system, we often face a challenge whether it is a coffee machine or a multifunction printer. How is that device functioning and what do I have to do to get a cup of coffee or to scan a page? While the functioning of many devices has been obvious in the past, the digitalization of the technical environment has led to the fact that we are increasingly failing to meet the challenge and finally fail. Contrary to other areas of life, however, failure in usage of technology often does lead to serious consequences; what fails is merely an action. This can root from different causes: a lack of knowledge and skills, the task is too complex, the user interface of the technical system is badly designed and the organization-related context prevents the success of the action. These causes act on their own, on the other hand they interact with each other. Actions can be controlled in various ways: by thinking and solving problems, by applying learned rules and by automated unconscious routines. On all three levels of control, mistakes and failure are ultimately inevitable. However, the probability of failure can be reduced, in particular, by a Human Centred Design approach. On the other hand, failure can also be quite intentional, for example, when technical safety barriers prevent to perform dangerous actions before they unfold their harmful effects. However, the idea of replacing unreliable humans with reliable technical systems and thus preventing a failure does not work, because humans can also fail as developers, programmers and designers of technical systems. This is why blind trust from users in technology occasionally leads to failure, as numerous curious events in the use of navigation devices show. When the Olympic Games in Rio de Janeiro 2016 were over, the topic “failure” was discussed everywhere. When we think about the meaning of failure in sports, we of course think of teams, athletes, coaches, countries, federations, or clubs. Sports is all about winning and losing. It’s about satisfaction or frustration. It’s about ups and downs. It’s about success or failure! The Soccer World Cup 2006 in Germany was a good example of “failure”! What a torture, what a disaster to have lost to Italy in the semi-final of the tournament. All of us felt hurt. We just could not believe it. We had all failed, not only our team. This experience is emotionally hard to explain. Germany was right on target to become the new world champion. There was no doubt. Afterwards, we all needed weeks to overcome the loss to Italy. Another “virus of euphoria” accompanied us during the soccer world cup in 2014 in Brazil. This time it was the opposite. We did not fail! We all suddenly were champions – the players, the coaches, the fans and the country. What a feeling! Success and failure in sports has to do with emotions. We all don’t like it, but it is part of the game. Failure is the misery part of the game, but necessary to increase our performance and perhaps to help us become great. (Powell, 2008) Failure forms personalities, competencies and character. Failure is a life experience, challenge it and you will get the chance to become someone special. Michael Jordan once said: “I’ve missed more than 9000 shots in my career. I have lost almost 300 games. Twenty-six times, I have been trusted to take the game winning shot and missed. I have failed over and over and over again in my life. And that is why I succeed.” The career of Michael Jordan was an outstanding one. But what does it all mean when the lights are off, when the time is over, when nobody wants to have an interview anymore? We are going to describe the meaning and the consequences of failure in sports for athletes and coaches, federations and clubs. We do not intend to examine all the phenomena of failure in detail, but we will discuss failure and how to deal with it. Furthermore, we will discuss what failure means for the stakeholders in the context of high-performance sports. Harry Fuhrmann is an internationally working stage director and writer. He founded his own theatre company and created several research pieces. We talk about the staging of failure, why all the great plays in history tell stories of failure, reasons for differences between men and women, the role of civic conditions, of dreams, of clowns, and about One as the loneliest number.